Vincent Gray has a host of reasons to run for re-election next year as Washington's mayor - and one big reason not to. The first-term Democrat can highlight successes including a booming real estate market, a rapidly expanding population and reductions in violent crime in the nation's capital. But a long-running federal investigation of corruption in city politics looms over a potential re-election campaign for Gray. With less than seven months before the Democratic primary for mayor, which has traditionally decided the race, Gray is being coy about his intentions - and the contest is mired in uncertainty. Gray insists he has not made up his mind and has no timetable for a decision. He sounds like a candidate when he lists his administration's accomplishments, and he notes he has never entered a race early. Gray would have to field more than a few questions about his last campaign should he run again. U.S. Attorney Ronald Machen has said Gray's 2010 Democratic primary victory over incumbent Adrian Fenty was tainted because the Gray campaign received $650,000 in off-the-books funds from a businessman. Prosecutors dubbed the effort a "shadow campaign.'' Gray campaign aides also admitted paying minor candidate Sulaimon Brown to stay in the race and disparage Fenty. All told, four high-level aides to Gray's 2010 campaign have pleaded guilty to felony charges, and more charges are likely. The businessman suspected of funding the shadow campaign, unidentified in court documents, is Jeffrey Thompson, according to two people familiar with the investigation. The individuals spoke on condition of anonymity because they were not authorized to disclose the information. Court documents show he is the subject of a grand jury investigation. However, he has not been charged and Thompson's lawyer has repeatedly declined to comment on the investigation. All of those convicted have agreed to cooperate with prosecutors. Machen has also secured unrelated convictions against a D.C. Council chairman, a councilmember and a former councilmember. 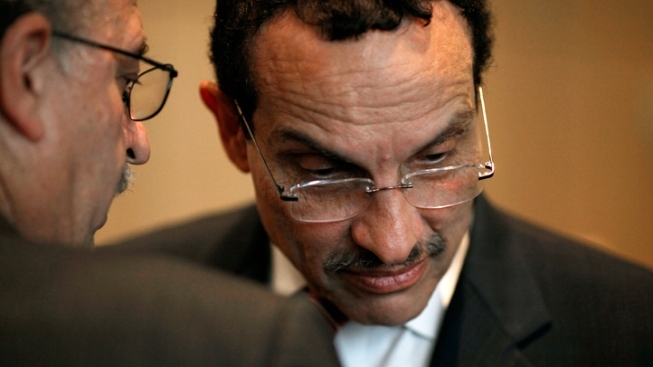 "There is no reason whatsoever to believe that Mayor Gray, without the investigation and scandals that have surrounded his 2010 campaign, would even consider for a second not seeking re-election,'' said Chuck Thies, a political consultant and commentator who supported Gray in 2010. The mayor's attorney, Robert Bennett, declined to comment on whether he has advised the mayor about a re-election bid. Gray rode a wave of dissatisfaction with Fenty in the African-American community to victory in 2010. A Washington native, he previously served as a council chairman and a councilmember. He's also run the city's human service department and a faith-based group focusing on the homeless and at-risk youth. If Gray did run, he could point to other accomplishments. He has balanced budgets while increasing the city's reserve fund and maintaining its high bond ratings. Although critics say his education policies are too cautious, test scores in the city's troubled schools are trending upward. Aides point to the mayor's age - he'll turn 71 in December - as a factor in his decision, but Gray has had no serious health problems and appears vigorous, working late hours and maintaining a packed public schedule. Gray is barred from raising money for a possible campaign because he has not filed papers to run for re-election or established an exploratory committee. Some deep-pocketed donors have yet to commit to a candidate while the race sorts itself out. One challenger, D.C. Councilmember Tommy Wells, said he was motivated to run for mayor, in part, by the scandals in Gray's campaign. He thinks Gray won't run again. Wells is one of six candidates whose names will appear on the ballot for the April 1 Democratic primary, which will be the earliest mayoral primary in the 40-year history of District of Columbia self-rule. The Democratic primary winner has gone on to win every mayoral election in the city, where Democrats have an 11-to-1 registration advantage over Republicans. The general election is Nov. 4. The other contenders are councilmembers Muriel Bowser and Jack Evans; former State Department aide Reta Lewis; businessman Christian Carter; and longshot candidate Nestor Djonkam. Other candidates could jump in, including Councilmember David Catania, an independent who would challenge the Democratic primary winner in the general election. There has been no independent polling of what city voters think about the mayoral field, but Gray's job-approval numbers have suffered as a result of the scandals. A Washington Poll in July 2012 put Gray's approval rating at 29 percent and his disapproval rating at 59 percent. Supporters and opponents agree that if Gray doesn't plan to run, he might as well keep people guessing. William Lightfoot, a former councilmember and Bowser's campaign chairman, said Gray doesn't want to cede any power. Thies: Are Shadow Campaigns Stealing D.C. Elections?